A joint project of mixologists from RedCoil and One Hit Wonder, representing e-liquids specially developed for POD-systems, which have become popular recently. Liquids for devices of this class are characterized by the presence in them of salt nicotine and its high content for the rapid achievement of nicotine saturation. 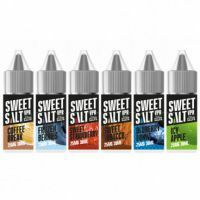 As the nicotine in the liquid is used the American development TruNic 2.0 Nictotine Salts, the strength of the liquid is 25 mg.
SWEET SALT VBR 30ML BY SWEET SALT LABS AND ONE HIT WONDER Frozen Berries — Sweet Salt VPR: Berries, cold. Sweet T..